"Go West" Feral Woman: Uncle Eddie. He loved to listen to Cub games on the radio. He could sit and put together a jigsaw puzzle for hours. His favorite reply was "sure!" and he was our Uncle Eddie. remember Busia with Uncle Eddie? She was determined to raise Uncle Eddie just like her other children. My grandmother's heart was fierce for this boycub of hers. But then life isnt always easy either. So whats most important is they made sure he had opportunity to grow. know that he was loved too. no matter what our limitations are. You helped raise me into who I am today. What a great post. My mom worked with Down syndrome children. They are such sweet and loving people. And they do love to hug! i like your grandmother - a good woman. sweet tribute to your uncle, too. 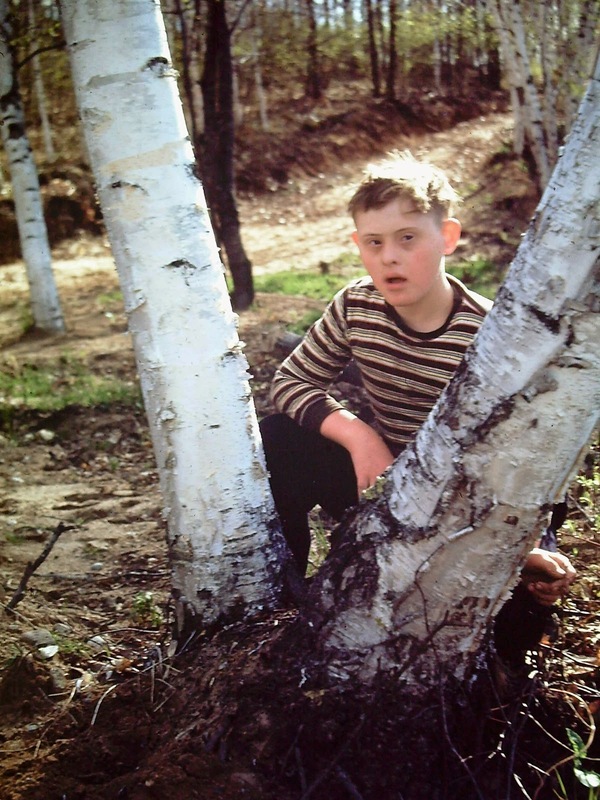 Thank you so much for this post, my sister had the worst type of Down's syndrome, she was not supposed to live long, but died in 2005 at the age of 58. She couldn't talk or have eye contact with you, yet she was so full of joy and love. My sister. I have been away from blogging for a while and had no idea about Dexter Dog. I was trying to learn to use feedly and since your blog is on the top I chose it and saw his adorable face. Then I read, and I cried, I still am. And I am so, so sorry. I know how much he meant to you. I hope Samson will make you smile sometime again in the future. It may well be way too soon now. Please take care, my friend, and I am so, so sorry for this loss of your best bud. Oh that was such a nice post. Heart felt and well said. Your grandmother was wise to listen to her heart. Sometime you hear the question-If you could interview someone alive or dead, who would it be? I think your Grandma would have to be one of my choices. I know back then if you had a child that was born not "normal" there was great pressure to institutionalize them, and most people did. The love and determination in your family is inspiring. RIP Uncle Eddie! You made a difference! A lovely tribute to Uncle Eddie, thank you for sharing! DS folks have the happiest souls and bring joy with their smiles. God bless your granma- what a woman of character! Shirley just said what I was going to say. Great tribute! What a great post. And what a great family. A whole lotta loving going on there - you're the proof. Your grandmother and Uncle Eddie were lucky to have one another, seems they taught and shared much with others as well. Learning about acceptance and loving people as they are , for the wonderful souls they are is a gift all the way around. Then I decided to have a look around your blog. I read this post and was so touched by it. I love how your grandmother raised your uncle and how "her heart was fierce for this boycub of hers". Life goes on doesn't it, but it's the knowing of special acts by special people that uplift us at times.